We’re almost ready to put our new book about South Wales Transport to bed now. Like the printers, there are a host of people eagerly waiting to get their hands on Return Ticket – The story of South Wales Transport! There’s no secret as to why this is the case. It seems word has got out about its lavish collection of many previously unpublished images. They not only reflect the changing times of a much loved bus company, but also those that have taken place in and around the city of Swansea which was the company’s main territory. Alongside the historical timeline of the company there are countless personal memories, anecdotes and tales from passengers, staff and managers. The photographs too, drawn from far and wide -- many previously unpublished -- contribute hugely to the fascinating tale. Many of these images contain nostalgic scenes of Swansea past, which are sure to bring memories flooding back for many. The book is being launched at the prestigious Wales on Wheels event at Swansea Waterfront Museum on Saturday, May 17th. There’s already enormous interest in Return Ticket with advance orders being received from across the UK and even Australia. Return Ticket – the Story of South Wales Transport can be ordered now on our books page. Be one of the first to get your hands on a copy. Better still why not come along to the launch. Fantastic news about the launch of our latest book Return Ticket – The story of South Wales Transport is that popular Welsh broadcasting personality and bus enthusiast Roy Noble has agreed to do the honours. Roy will be joining us at the event which is being held at the Waterfront Museum, Swansea at 2pm on Saturday, May 17. He will be joined by Welsh business and transport guru Garel Rhys and the book’s author Jonathan Isaacs. Roy will be taking the wraps off our latest title – Red cream and a touch of Gray – The Western Welsh story at Barry Festival of Transport on Sunday June 10th. The launch will take place at the former Western Welsh Depot, Broad Street, Barry at 11.30 am. Self- confessed bus enthusiast Roy has also contributed a wonderful foreword to the book, full details of which appear in our Coming Up and Books section. The book will be available for the first time after the launch with Author Colin Scott hand on hand to sign copies. Barry Festival of Transport is a split- site event and the depot will be linked to the main show area by a series of services operated regularly by classic buses. For bus enthusiasts in general and fans of Western Welsh in particular the day, of which the book launch is one of the highlights, promises to be unforgettable. Full details of the book and how you can obtain a copy can be found elsewhere on the web site. Copies are limited so don’t delay, order today. 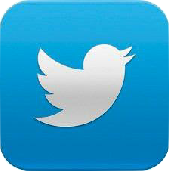 If you have any difficulties go to our contacts page. 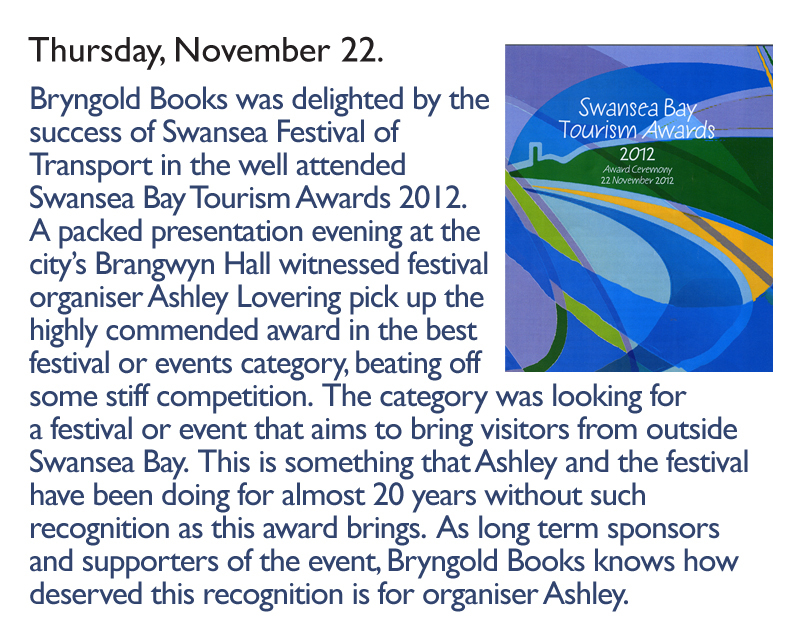 Make sure you visit the Bryngold Books stand on the day to see many other transport titles available. Swansea – Simply the best! 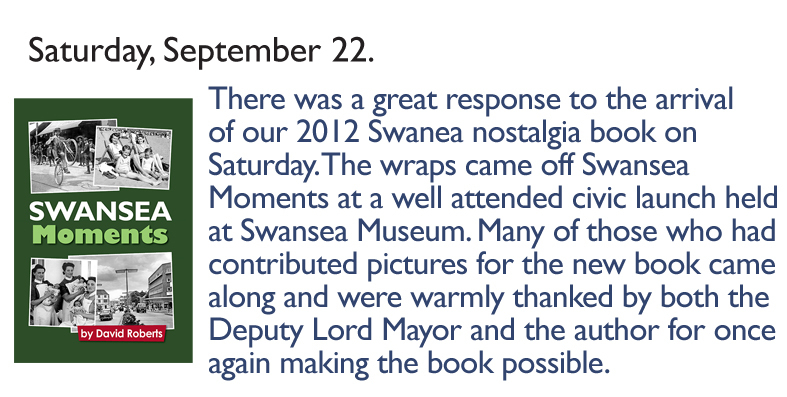 This was the day that saw the launch of Swansea – Simply the best, our third new title in just a month! It proved once again that Bryngold Books is at the forefront of recording the past in South Wales and beyond. 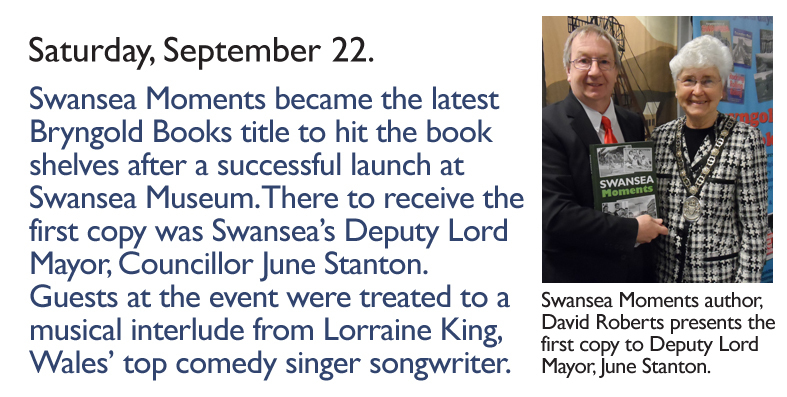 The civic event was hosted by Swansea Museum and the unveiling was carried out by the city’s Lord Mayor, Councillor Ioan Richard who was presented with the first official copy. An excellent gathering of people listened to a number of interesting anecdotes from the Lord Mayor, eagerly awaiting their opportunity to grab what is the 14th book on the city compiled by David Roberts in as many years. Judging from their comments they were not disappointed with the result. Memories can manifest themselves in many ways as the variety of fascinating images in Swansea – Simply the best! demonstrates. They capture much that has occurred down through the decades and evoke endless nostalgic thoughts. Few memories however will rival those, much closer in time, of the day when Swansea City became the first club in Wales to win promotion to football’s Premier League. The jubilant scenes and celebrations that followed are the stuff of pure nostalgia. Swansea – Simply the best! includes views of the Vetch Field, where it all started and some exciting moments from past encounters. It would be difficult to unearth anything else that has gripped the city in such a way or had such an impact, for some time. Alongside such a high profile event there are others, less significant perhaps, but which will be recalled just as fondly. Better still the Swans scored their first Premier League goals on our launch day and with it their first winin the league. Along with the successes, this year brought sad memories too. Not least the closure of Mumbles Pier for refurbishment and a transformation that will take it into the next century, along with much development around it. There are images of the pier within this book and they will serve as a reminder of how it was when the wraps eventually come off the new. Swansea – Simply the best! is a compelling collection of fascinating images which reflect the city and its people at work, rest and play on their journey through many decades. It is a must for every generation. A nostalgic look at an ever-changing community with approximately 400 photos that say much about the way life once was. This is a book that’s guaranteed to refresh the memory and there will be few who turn its pages and fail to find some link with their own life in the past. To buy a copy go to our books page now. 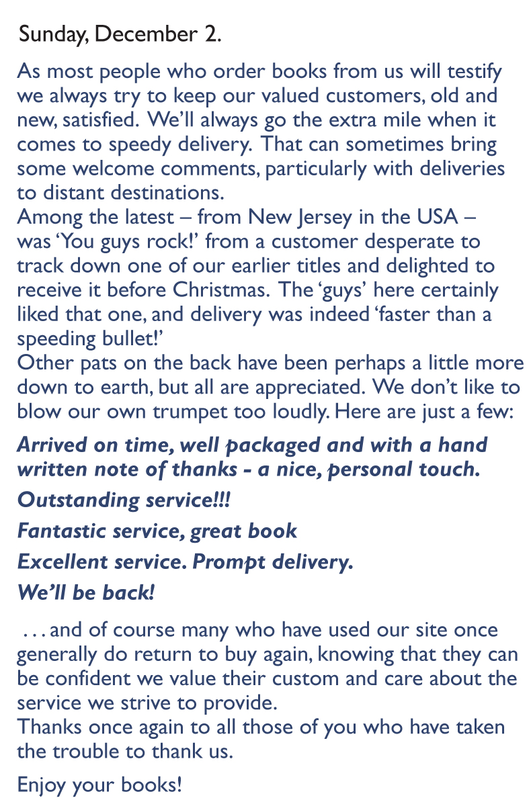 Please spread the word about the books arrival. Lord Mayor of the city & County of Swansea Councillor Ioan Richard takes a moment at the launch of Bryngold Books’ latest publication Swansea – simply the best! to tell an interesting story about the Mayoral chain. Looking on is the book’s author David Roberts about to present the Lord Mayor with the first official copy of the new book. 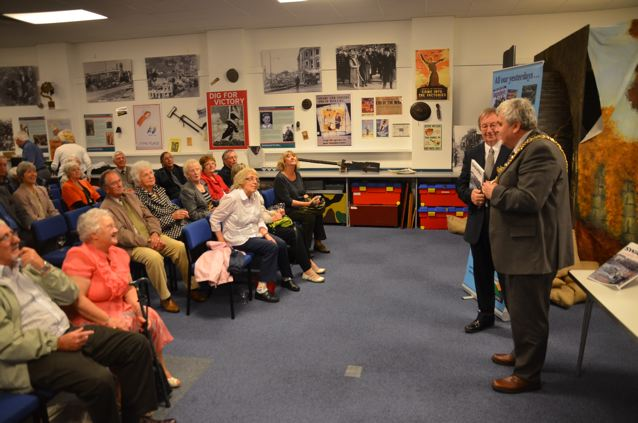 The well attended civic launch was held at Swansea Museum. Some of the guests at the civic launch of Swansea – Simply the Best! published by Bryngold Books listen intently to the city’s Lord Mayor Councillor Ioan Richard during the event. 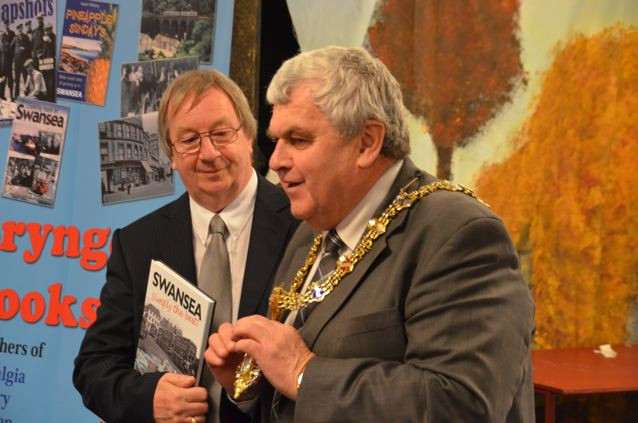 Author David Roberts presents the first official copy of Swansea – Simply the best! to Lord Mayor of Swansea Councillor Ioan Richard. The book is the 14th produced by David in consecutive years and gives Swansea an ongoing pictorial social history that cannot be matched by any other British town or city. The main square of the Aberafan Shopping Centre at Port Talbot was thronged with people on August bank holiday Saturday all intent on witnessing the civic launch by the Mayor of Neath Port Talbot, Councillor Harry Bebell of the latest pictorial nostalgia book complied by Bryngold Books director David Roberts. The book is the thirteenth to be produced by David in consecutive years and once again contains around 400 fresh and fascinating images of people and places in Neath and Port Talbot down many decades. After introducing the Mayor and Mayoress, David presented the civic couple with the first copy off the press. Councillor Bebell welcomed the arrival of the new book for which he had written a foreword saluting David for capturing the spirit of the two towns in the past. The crowd that had gathered for what has almost become an annual event was swelled by passing shoppers and with the official proceedings over there was a clamour to be one of the first to grab a copy of the latest book. Both David and the Mayor appealed for anyone with pictures almost up until the present day of life in Neath and Port Talbot to share them for what will hopefully be the next Neath and Port Talbot book. retail outlets in both towns. This was the day when the first of our titles off the blocks for 2011 was released and it came at the end of a frantic week of media coverage of the 70th anniversary of the wartime catastrophe in which we featured significantly. The civic launch of Swansea’s Burning – Remembering the Three Nights’ Blitz took place in the foyer of Swansea Civic Centre at Oystermouth Road. Star of the show, apart from the book’s author David Roberts and the Lord Mayor and Lady Mayoress, Councillor and Mrs Richard Lewis was one of the fire engines that had been involved in fighting the fires that resulted from the German blitz on the city during the three nights of February 19, 20 and 21, 1941. The Dennis ‘Big Six’ fire engine now immaculately restored and back in the city drew much attention and certainly attracted the crowds. Also helping to bring back memories of those distant wartime days were members of the Swansea 1940s museum at Fabian Way, Swansea (Always worth a look). Quite a number of them had donned military uniform to add their own input to the launch. Additionally, one woman had travelled from Bridport in Dorset to attend the event – dressed as a Land Army girl. Thanks to you all for making the unveiling of this very special book such a resounding success. The event was very much a team effort. Thanks to our hosts at the civic centre, the amazing staff at Swansea Library who along with West Glamorgan Archive Service had mounted a special photographic exhibition of those dark days of World War Two. A talk by Swansea photographer and historian Roy Kneath which followed the launch also proved a big hit with a huge number of people wanting to attend. It was so popular that the talk may be repeated. Finally, a huge thank you to everyone who played a part in making Swansea’s Burning possible. Their efforts make the book a salute not just to the people of Swansea in wartime days, but also those who make it what it is today. 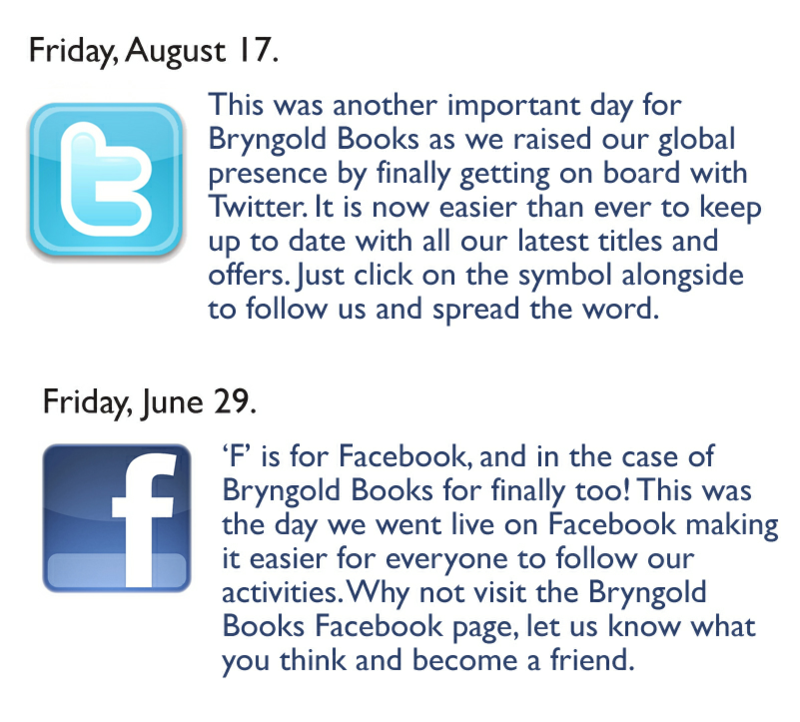 Bryngold Books will be offering a range of special show offers that will provide ideal Christmas gifts. Come early and don’t miss out. This is an ideal event for those who like taking a peep back at transport of days gone by and helping a worthwhile cause at the same time. It’s all under cover and a great venue to head for on an autumn Sunday. The clock is ticking on the launch dates of our 2013 pictorial nostalgia books. Swansea Our City is set to be as popular as all the previous books in the series by David Roberts. Once again it is packed from cover-to-cover with a selection of unique images. It is definitely a book not to be missed. Fans of this ever popular series are welcome to attend the launch event at Swansea Museum, (RISW), Victoria Road, Swansea at 2.15pm on Saturday, September 14. Come along and be one of the first to own a book that is sure to be a hit. 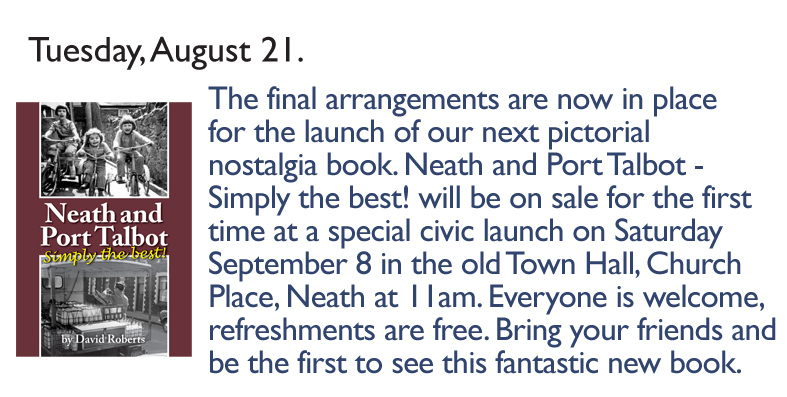 Meanwhile, fans of our Neath & Port Talbot series will also not have long to wait for their 2013 offering entitled Neath & Port Talbot Moments. Watch out for launch details here. To order either of these books in advance, or for retail orders, phone 01639 643961 now. Definitely no time for finishing crosswords for our chief David Roberts these days. 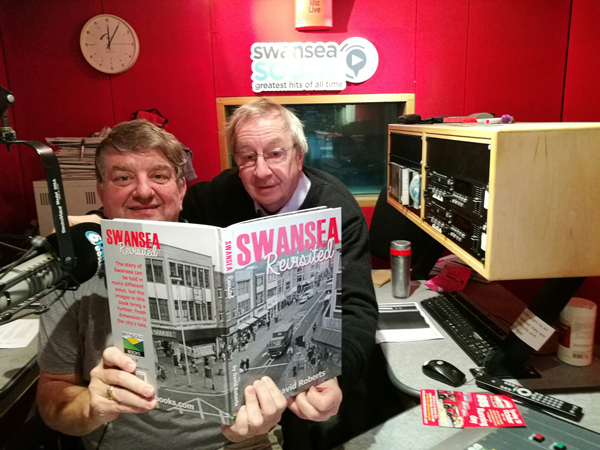 When he's not out on a delivery run we've got him doing the grand media tour and here he is at Swansea Sound with the doyen of the station's presenters Leighton Jones promoting our latest book Swansea Revisited. As usual it's packed with magnificent memory jerkers and these two simply couldn't stop talking about the way the city once was. Thanks to news caster Claire Pearson for snapping the moment. Who knows the picture might end up in a book of its own one day. It’s in the bag! . . . or should we say in the box? This is the very first Neath and Port Talbot Memories are made of this book to appear before our eyes thanks to the valiant efforts of our friendly van driver Malcolm this sunny afternoon. The new book will be in as many shops as we can reach tomorrow. Don’t forget you can order direct from this website with no postage to pay for. Down the bay today! 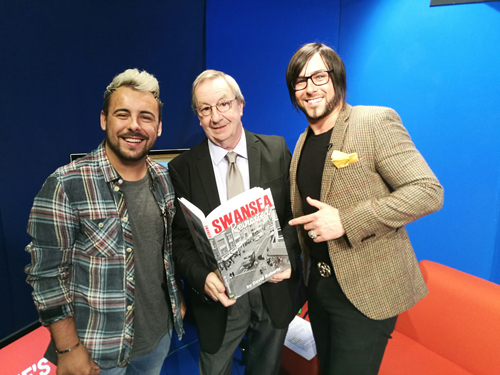 Joined the guys on Bay TV Swansea’s popular lunchtime programme to spread the word about Swansea Revisited, our latest pictorial nostalgia book on the city. 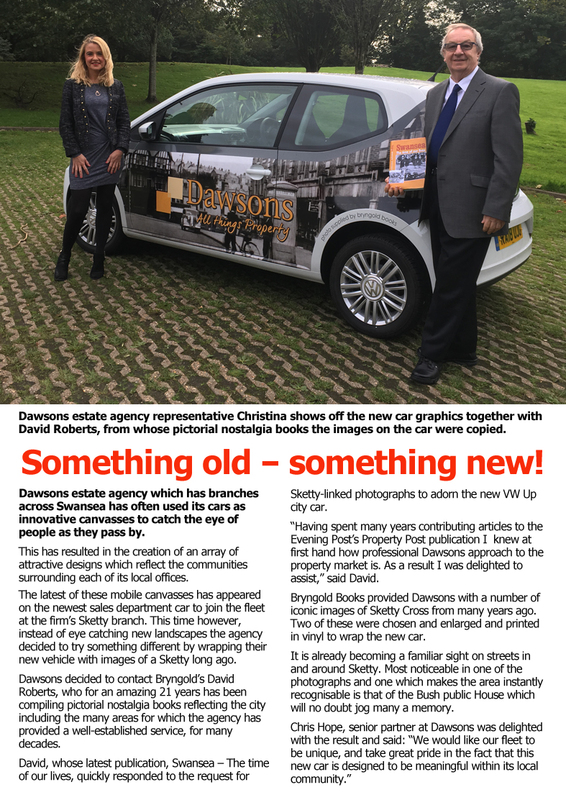 Shared the spot with Llanelli entrepreneur Kevin Green and two members of Swansea Ramblers. If you've seen this fascinating new book and liked it please help us to spread the word. Delighted to see some excellent coverage in the South Wales Evening Post for our latest nostalgia publication Swansea Revisited. The two page spread contained a selection of fantastic photos from this, the 19th book in the series, in consecutive year’s. The response so far has been excellent with a greater than usual number of orders from exiles far and wide. For more details on the book check out our books page. Don’t forget postage and packing is now free! 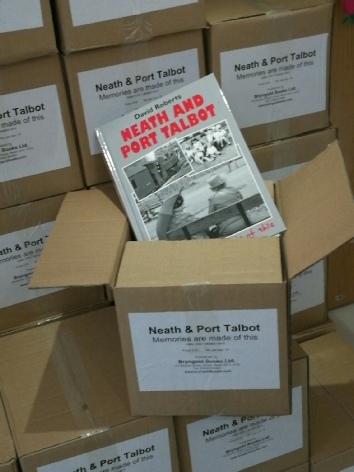 Great news today Neath and Port Talbot Memories are made of this has rolled off the press. Some last minute checks before it gets the green light to be bound, boxed and delivered ready for sale. Here is a sneak look at the cover. We’re all delighted by the initial response to recently released Swansea Revisited. Word is spreading about some of the eye popping photos from the past that the book has unearthed long may this initial enthusiasm continue. 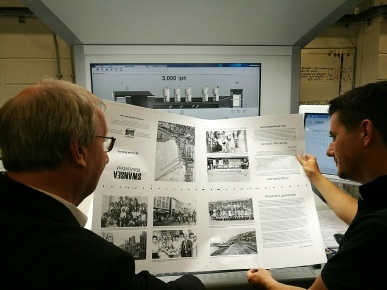 Our main man David Roberts makes some final checks as his latest Swansea pictorial nostalgia book Swansea Revisited begins to roll off the press at Gwasg Gomer / Gomer Press, Llandysul. On sale at the end of the month, details on our website. This year sees a very special event in the history of Swansea. For it marks the 75th anniversary of the city’s greatest battle for survival. Its people experienced their darkest days during the Three Nights’ Blitz of February 1941. Bryngold Books is delighted to announce a further 75th anniversary salute to these brave people in the form of a reprint of our successful sell out book Swansea’s Burning. Watch out for details. Bryngold Books is delighted to have it’s usual stand at Swansea Bus Museum for it’s annual Family Fun Day. Delighted to receive our first delivery of the newly printed 2014 Swansea book, Rolling back the Swansea years. It’s the 17th title in as many consecutive years – not a bad achievement. This year’s book has a fresh new format which we hope everyone will be as pleased with as we are. A slightly overcast day saw Bryngold Books setting up their pitch at Pembrey Country Park for Pontarddulais Car Club’s annual show. The event had been pushed out of its regular spot in Llanelli by the Royal National Eisteddfod of Wales, which reduced visitor numbers according to the show’s regular stall holders. Another sunny day and another successful event. This time the Aberavon Beach Festival. The beach front was thronged with people all day and it was a delight to meet some of our favourite customers. Bryngold Books was proud to sponsor the annual Under Milk Wood classic and historic vehicle run from Bracelet Bay, Mumbles, to Laugharne. The event was part of a magnificent celebration of transport organised by Ashley Lovering. It was followed the next day by the 21st Swansea Festival of Transport. Our stand at the event was a magnet for friends old and new. Those who were there at the National Waterfront Museum, Swansea certainly won’t forget the day we launched our latest book, Return Ticket – The story of South Wales Transport. 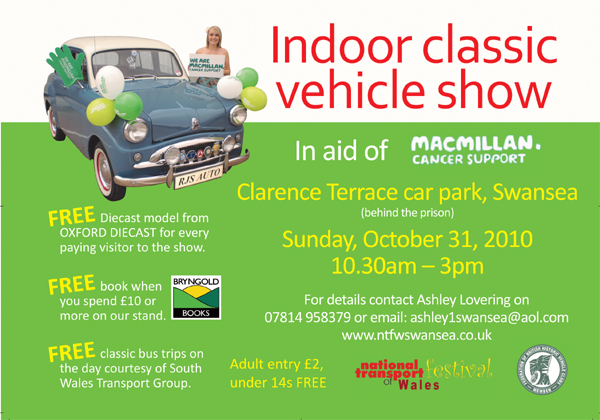 The event was part of the second annual highly successful Wales on Wheels transport spectacular. Ironically it was transport or at least the city traffic that nearly scuppered the whole proceedings. Once again Swansea was log-jammed and many people including our star guest Roy Noble spent hours overheating in traffic jams across and around the city. Despite all this, most people including Roy along with Welsh business and transport guru Garel Rhys, along with the book’s author Jonathan Isaacs made it in time. The event was packed out and accompanied by a film show of some of the pictures that didn’t make the final harvest for the book. Sales were brisk after the event and the book can still be bought at the museum. One sad note to proceedings at Bryngold Books has been the non-appearance this year of a title in our long running Neath Port Talbot pictorial nostalgia series. We are sorry to disappoint all the loyal buyers and readers of this, but it was unavoidable. People have regularly been asking why? Well the reasons are many and varied, but top of the tree has to be the gradually declining availability of fresh pictures and also the increasing popularity of Facebook sites trawling up more and more images. Alongside this is the growing number of people who gain their enjoyment from scanning pictures from our books and including them on FB pages. This is not only unfair, ignores copyright laws but more importantly stops people buying the books. With fresh offers of photos perhaps the book will re-appear one day or perhaps something different will slot into its place. In the meantime a huge thank you to anyone and everyone who has supported us with the book down the years. We really could not have done it without you. 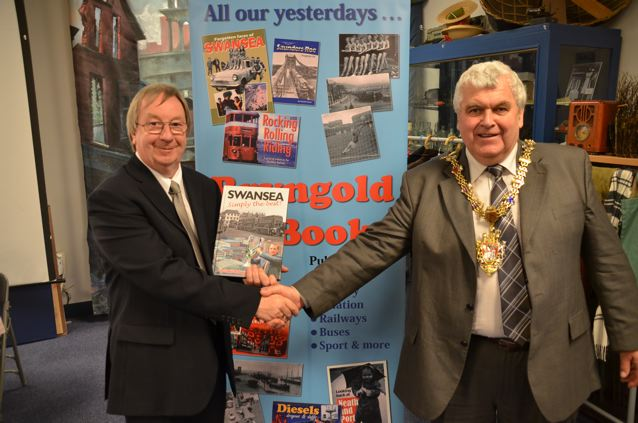 Bryngold Books supporting Swansea Bus Museum and Santa! Never mind Jingle Bells, Rudolph's resting for his upcoming global gallop so Swansea Bus museum is stepping in to ferry children, mums, dads, nannas and bampas to to Santa's special South Wales grotto. Join in this really special, magical experience aboard a heritage bus. Come aboard for carols, candies,happy headgear and lots of fun and a meeting with Santa. All it takes is a glance at this poster and a phone call. But hurry places are going fast. Please share far and wide.